Amendment 69 in Colorado would reshape Colorado’s tax and health care system with a new 10 percent payroll and income tax and a new public option health care system. The 10 percent payroll tax is in addition to Colorado’s current 4.63 percent income tax. The economic incidence of payroll taxes is borne by employees, not employers. Splitting responsibility for the payment of the tax between employer and employee does not change the economic incidence. The new tax would apply on the first $350,000 of income for singles or $450,000 for married couples. Income above those levels would be exempt from the tax, creating disparities in effective tax rates for Colorado residents. Individuals earning $50,000 would pay a higher effective tax rate than those earning $1 million. Uniquely, ColoradoCare would operate almost entirely outside of the state’s governmental structure, governed by a board of trustees with unusually broad authority, including over the premium tax that would fund its existence. If adopted, Colorado’s rank on the State Business Tax Climate Index would plummet from 16th overall to 34th, and from 16th to 32nd on the individual income tax subcomponent. Amendment 69 in Colorado would dramatically alter the state’s tax and health care systems, coupling a new 10 percent payroll and income tax with universal health care. Called ColoradoCare, Amendment 69 would hurt Colorado’s tax climate as the state would surpass California with the highest individual income tax rate in the country. Amendment 69 would create a new bureaucracy, with immense authority to change taxes, outside of the state’s current balance of powers, eliminating transparency for taxpayers. Colorado would plummet from 16th to 34th nationally on the State Business Tax Climate Index, confronting voters with an important choice in the Centennial State. ColoradoCare would reshape Colorado’s tax and health care landscape. The constitutional amendment consists of two parts: a new payroll and income tax and a new universal coverage health care delivery system. If adopted, Amendment 69 would create new payroll tax (called the premium tax) totaling 10 percent. Responsibility for paying the payroll tax would be split between employer and employee. Employers would pay 6.67 percent and employees would pay 3.33 percent, for a total of 10 percent. This would be in addition to Colorado’s income tax of 4.63 percent. The amendment also includes an income tax provision for those individuals without wage income and wage employees with supplemental income. It would be charged on income from interest, dividends, business income, capital gains, pensions and annuities, and real estate income. Social Security income in excess of $33,000 (or $60,000 for married filers) would also be taxed at the 10 percent rate. The taxes are capped and do not apply to the entirety of income for higher-income individuals. The 10 percent payroll tax and 10 percent income tax only apply to total income below $350,000 for individuals and $450,000 for couples. This creates a reverse tax cliff. Income above the $350,000 and $450,000 thresholds would not be subject to the Amendment 69 tax, meaning that high-income individuals face much lower effective tax rates. During the first several years of ColoradoCare startup, a startup tax of 0.9 percent would apply to payroll income. The 0.9 percent will be split between employer (0.6 percent) and employee (0.3 percent), and can continue for up to three years. Non-payroll income would also be taxed at 0.9 percent, but only 50 percent of the total non-payroll income. Once the provision of health care starts, the tax increases to the full 10 percent. The initial startup tax of 0.9 percent is estimated to raise $4.9 billion within the first several years to facilitate setting up the new health care system. In 2019, the first possible year of ColoradoCare’s health care delivery system existing, the tax is estimated to generate $25 billion. This would almost double Colorado’s general fund budget, which is $27 billion in 2016. The revenue raised from the new tax will be combined with Colorado’s federal Medicaid matching contribution to fund ColoradoCare’s $36 billion annual budget, but those funding sources are likely inadequate. Even in the first year, the Colorado Health Institute estimates that ColoradoCare would have a deficit of $253 million, suggesting that the 10 percent tax rate is set too low. Much of what has been written on Colorado Amendment 69 argues that the 10 percent tax is a payroll tax, not an income tax, and that calling the tax increase an income tax is misleading. But this is a distinction without much of a difference. Whether the tax is a payroll tax or an income tax, the employee bears nearly the full economic incidence of the tax. The legal incidence of a payroll tax differs slightly from an income tax. With an income tax, an employer does not have a direct tax burden. The employer might withhold and remit the tax on behalf of the employee to simplify the administration of the tax, but the employer has no legal obligation to pay the tax. A payroll tax, however, is different. A payroll tax generally requires that an employee withhold and remit the tax on behalf of the employee, but the employer also is charged part of the tax itself. In the case of the ColoradoCare premium tax, the employee will pay 3.33 percent, which will be collected and remitted by the employer, and the employer will also need to pay 6.67 percent from its budget. The legal incidence resides on the employer for its 6.67 percent. The economic incidence of the tax is different, as it resides with the employee. Employee compensation includes a number of elements: wages, the value of benefits, and the cost of taxes associated with employing the individual. Raising the cost of any of these inputs, including raising the payroll tax, lowers the demand for labor. Employers reveal their lower demand in several predictable ways. Employers could lower wages for employees, allowing them to maintain the same compensation costs, or they could reduce benefits, hours worked, or even their total workforce. The amount that wages or benefits are cut matches the cost of the payroll tax. ColoradoCare’s new tax should be considered an income tax for all Colorado residents for all intents and purposes. ColoradoCare’s payroll tax violates the tax principle of transparency. Employees will see the 3.33 percent tax on their paystubs, but they will not see the 6.67 percent paid directly by their employer. Employees will be paying the tax indirectly, but the tax is functionally hidden from them. As noted previously, the entire economic incidence of the ColoradoCare premium tax falls on employees, making it the functional equivalent of a 10 percent income tax atop the state’s existing 4.63 percent single-rate individual income tax. The only meaningful economic distinction between an income tax or a payroll tax in this context is the $350,000 cap, which means that a single filer would never pay more than $35,000 in ColoradoCare premium taxes. A cap is consistent with the payroll tax structure, and the intent to associate payments—however loosely—with health care premiums, but does yield some interesting results. A Coloradan with $50,000 in taxable income would face a combined individual income tax and premium tax effective rate of 14.63 percent, whereas a Coloradan with $1 million in taxable income would face an effective rate of 8.13 percent and a Coloradan with $10 million in taxable income would experience an effective tax rate of 4.98 percent. Table 1. Individual Income and Premium Tax Liability by Taxable Income. Companies with employees in multiple states could either seek to offer a narrower set of benefits to Colorado employees or could provide identical benefits to employees in all states despite being subject to premium tax in Colorado, in which case their employees would have ColoradoCare as a secondary insurer, covering any costs that their primary insurer does not. Similarly, individuals in Colorado who choose to retain private coverage—either through their employer or through their own purchase—would still need to pay the new 10 percent tax, even though they are not using any of ColoradoCare’s health care services. Although proponents anticipate savings based on Colorado medical providers no longer needing to interface with insurance carriers, some such transactions remain inevitable. Individuals visiting Colorado from out-of-state will, of course, have to rely on their own insurers, who must be billed by Colorado medical providers. Some individuals will carry policies that provide coverage outside the scope of ColoradoCare, while others may still receive employer-provided insurance. Moreover, since ColoradoCare would contract exclusively with Colorado providers, some Coloradans may find it necessary to maintain insurance policies to ensure their coverage while traveling out-of-state. In these cases, ColoradoCare would be treated as a secondary insurer, and health care providers would be required to bill the private primary insurer first. Another potential complication arises from uncertainty about federal treatment of the new premium tax. Four classes of state and local taxes are deductible for federal income tax purposes: income, sales, real property, and personal property taxes. Only one state (Nevada) currently imposes a payroll tax. If the premium tax is classified as a payroll tax or health care tax by the Internal Revenue Service, then Coloradans would not be able to deduct them for federal tax purposes, and would thus face an effective tax increase on the federal level as well. While these powers in some respects parallel those of other elected officials, they exist outside the normal separation of powers. State legislators also vote on redistricting and enact laws governing elections, but—absent a veto override—they can only do so with the concurrence of the executive branch. Regulatory policy is vested with the executive, with oversight and occasional corrective statutory responses by the legislature. They may or may not be administered by the Secretary of State and local registrars, and if not, the ColoradoCare board would be required to establish its own parallel election system at considerable expense. The board could, theoretically, restrict spending on campaigns for or against tax increases it proposed, or establish restrictive eligibility requirements for trustee candidates. The criteria for interim board members is itself curiously restrictive: those appointing interim board members are required to make a good-faith effort to appoint individuals “committed to successfully implementing” ColoradoCare, a construction which could be read to exclude critics of the program. At present, the full scope of intended coverage under ColoradoCare is unknown. Amendment 69 enumerates 11 categories of coverage (e.g., hospitalization, prescription drugs, laboratory services, end-of-life care, etc.) but leaves it to the future board to set plan details. In order to obtain federal waivers, however, coverage would likely need to at least equal that which is available under Medicaid or on plans eligible for the Affordable Care Act’s health insurance marketplace. Although the new premium tax embodied in Amendment 69 would be implemented as a payroll tax, economically speaking, it should be thought of as a second income tax with a 10 percent rate. Should the state approve Amendment 69, not only would the top marginal tax rate on income be 14.63 percent—the highest in the country, exceeding California’s 13.3 percent “millionaire’s tax”—but this rate would be imposed on the first dollar of taxable income. It would also represent an inverted two-rate system: 14.63 percent on the first $350,000 in taxable income, and 4.63 percent thereafter. Colorado currently ranks 16th overall on the State Business Tax Climate Index, as well as 16th on its individual income tax component. The Index is a measure of the competitiveness of a state’s tax structure, and Colorado currently benefits from its low, single-rate individual income tax. At present, Colorado ranks better than five of its seven neighboring states. 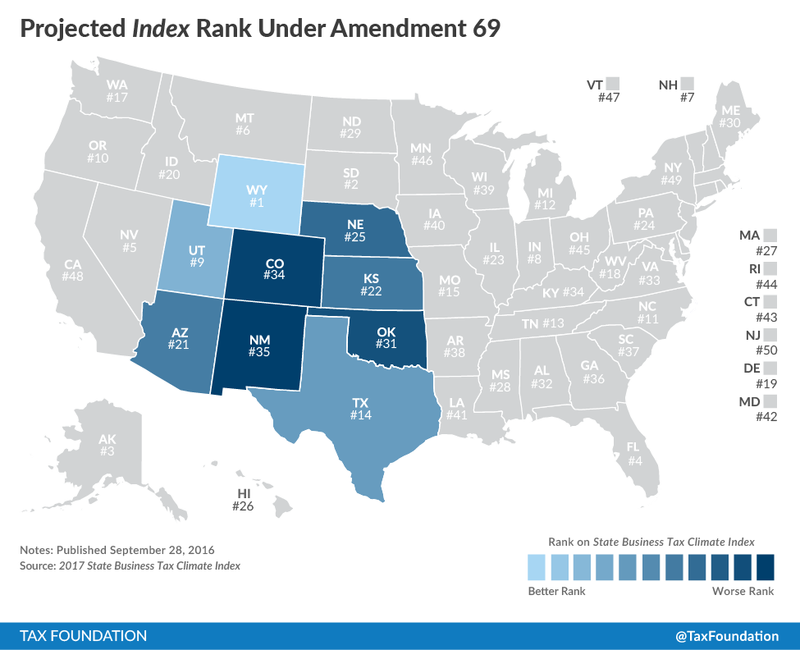 However, with the adoption of Amendment 69, Colorado would plummet to 34th overall, and 32nd on the individual income tax component, giving it one of the least competitive rankings in the region. Businesses and individuals weigh many options when deciding whether to move to (or remain in) a state; taxes are only one consideration among many. What is, in practice, a 14.63 percent income tax—and one that, for at least taxpayers, will not obviate the need to purchase some level of health insurance—would substantially increase the cost of living and doing business in Colorado, placing the state at a competitive disadvantage against many of its neighbors. Adoption of Amendment 69 would give Colorado the highest individual income tax of any state. Currently, Maine imposes the highest rate on the first dollar of income, at 5.8 percent. The highest marginal rate on Colorado’s median household income is the 9.3 percent rate imposed in California on income between $51,530 and $263,222. By contrast, the premium tax imposed under Amendment 69 would yield, functionally, a combined income tax rate of 14.63 percent on the first $350,000 in income ($450,000 for married couples filing jointly). While the cost of this tax would be at least partially offset for Coloradans who decide to forego private insurance in favor of ColoradoCare, this may not be an option for many Coloradans. There remains, moreover, substantial uncertainties about the administration of ColoradoCare and whether the proposed premium rates would be adequate to fund the program. Proponents tout ColoradoCare as a bold solution. It would certainly be that, but the mechanics of the program make it untenable. Health care reforms are outside of the expertise of the Tax Foundation, so our comments and critiques of Amendment 69 would focus solely on the tax change provision. Colorado Secretary of State, Amendment 69, §2 (12). Colorado Health Institute, “Colorado Care: An Independent Analysis, Finances,” August 2016, http://www.coloradohealthinstitute.org/uploads/postfiles/Financial_Analysis_Report_FINAL.pdf 5. 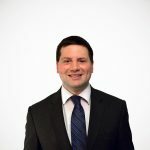 Marshall Zellinger, “Fact Check: Coloradans for Coloradans Political Ad Tells Voters Not to Vote for Amendment 69,” The Denver Channel, http://www.thedenverchannel.com/news/politics/fact-check-coloradans-for-coloradans-political-ad-tells-voters-not-to-vote-for-amendment-69. ColoradoCare Yes, “ColoradoCare: How Will It Work?” May 2016, https://www.coloradocare.org/wp-content/uploads/2016/05/Green-Booklet-5_5_16.pdf 40. See, e.g., Ivan Miller, “Executive Summary of Economic Analysis of the ColoradoCare Proposal Addendum with 2019 Projections,” Colorado Foundation for Universal Health Care, Aug. 3, 2015, https://www.ciab.com/uploadedFiles/Advocacy/Grassroots/Prop_69_2016/ColoradoCare_economic_analysis_summary.pdf. Denise Wentz, “No on Amendment 69: ColoradoCare Would Be Too Costly,” The Denver Post, Apr. 1, 2016, http://www.denverpost.com/2016/04/01/no-on-amendment-69-coloradocare-would-be-too-costly/. The Nevada Modified Business Tax is a more traditional payroll tax, payable only by employers with payroll in excess of $50,000 per quarter. See Internal Revenue Service, “Topic 503 – Deductible Taxes,” July 12, 2016, https://www.irs.gov/taxtopics/tc503.html. Colorado Secretary of State, Amendment 69, § 3. ColoradoCareYes, “Amendment 69: ColoradoCare: How It Will Work,” May 5, 2016, https://www.coloradocare.org/wp-content/uploads/2016/05/Green-Booklet-5_5_16.pdf, 41. 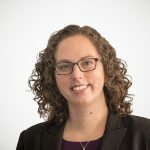 Nicole Kaeding, “State Individual Income Tax Rates and Brackets for 2016,” Tax Foundation, Feb. 8, 2016, https://files.taxfoundation.org/docs/TaxFoundation_FF500.pdf, 4. Jared Walczak, Scott Drenkard, and Joseph Henchman, 2017 State Business Tax Climate Index, Tax Foundation, Sept. 28, 2016, https://taxfoundation.org/article/2017-state-business-tax-climate-index.